Are you finding life difficult at the moment - relationships - work - family or personal problems - feeling stuck? Perhaps you’d like to help a troubled family member or friend find peace and contentment? Even the family pet might need help! Are you sensitive to energies, and thus to the shifting energy vibrations being experienced by many during these times of change? Shell and Coral Essences are vibrational remedies taken as oral drops and aura sprays. They are created using a similar method to that used by Dr. Edward Bach to create the Bach Flower Remedies. Shell Essences incorporate ancient wisdom with new vibrational self-healing techniques which are ‘read’ by our cellular memory. They access our DNA energies, and read our intrinsic spiritual-energy patterns helping us return to wholeness and wellbeing, and to the inner power of love. 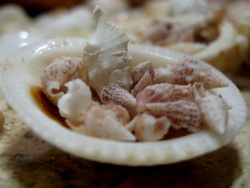 Shell Essences teach us to become self-healers. For the current newsletter click here. Why not give Shell Essences a try? They are fast acting and easy to use – the only side effect is feeling well! With higher vibrational energy now impacting the planet and humanity, the Activating Aura Mists are becoming more powerful and are very popular. Their effect is immediate; they are more acceptable to many people than drops, and the Mists are especially relevant for children (see testimonial). A light spray in the aura or around the living and work space is all that’s needed, and they can be used as often as required. The Mists remove negative and inappropriate energies and are a wonderful support for teachers, practitioners and parents, but can be used with great benefit by everyone. Each Mist is created from a special blend of Shell Essences in purified water with an Australian herbal food-grade preservative and either lavender or rose essential oils. first mist ‘Open to Receive’ encourages the release of fears and self-doubt. The second mist ‘Intuition Enhancement’ helps us access our higher messages of wisdom and healing. protective mantles, or auras, so we recommend spraying at least once a day. An aura spray to relieve tired, sore legs and feet perhaps caused by standing for long periods on hard surfaces, or sitting for long periods during eg air travel. This Mist clears the energy centers of the feet to allow positive direction in life. Cool Calm Connected Kidz and Adultz. self-reliance, creativity and a positive attitude. This space-clearing Mist creates feelings of harmony in home or work areas. It removes negative energy fields and emotional debris to re-create freshness and tranquillity, and is a useful spray for children’s bedrooms if there are sleeping problems. energies and times of change. Removes the negative energies of other people from our own energy body. These energy attachments can cause tiredness, irritability, physical and emotional discomfort and eventual ‘burn-out’. We recommend spraying aura regularly. This Mist can be sprayed on feet and aura to clear blocked stagnant energy which is preventing us from moving on with our life, or can be sprayed in living or work areas to clear energy blocks and allow positive progress. A calming, uplifting aura Mist to soften negative self-talk and the unconscious negative belief patterns which lead to feelings of stress, fear, and low self-esteem. This beautiful Aura Mist encourages unconditional love for self and others. Encourages self-confidence and belief in ones own ability to achieve. 40 Light-Healing Cards and Booklet Pack ~ The Light-Healing cards feature photographs depicting each shell used for an essence. On the reverse of the card is an affirmation or mantra - healing harmonic energy. The Harmonic opens the central chakra to the third eye, which is our psychic centre. The cards access a healing flow of Venus energy, and also have the added dimension of colour healing. The 12 Infinite Energy Essences Cards ~ The Infinite Energy Essences Cards resonate to a higher vibration, and are particularly empowering to those who are working with the spiritual healing and growth of themselves and others.